The game so nice, they reviewed it twice! 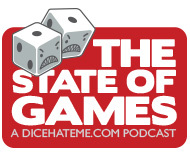 Some of you dear readers (and listeners) may find this review of Lords of Vegas familiar or redundant – that’s because Monkey238 and I mentioned it as something awesome in our recent State of Games podcast. Since that podcast had a mighty spoiler warning, we thought a few of you might have missed out on a great game. So here, for you enjoyment, is the full Dice Hate Me treatment for Lords of Vegas. Everyone remembers their first time in Vegas. The heat. The smoke. The free drinks. The ever-present and exciting ding-ding-ding of a slots payout drifting from three rows over. And that’s just at the airport. Yes, Vegas has a certain special appeal. Spend three days there and you’re on an hourly roller coaster of emotion – love it, hate it, love it, loathe it, can’t live without it. What if I said you could get that same experience at your kitchen table, all without losing your second mortgage to a sly dealer? Well, hit the bank and grab some dough; when I’m done here, you’re going to want the Lords of Vegas experience. You can bet on it. The casino groups - a classy bunch. 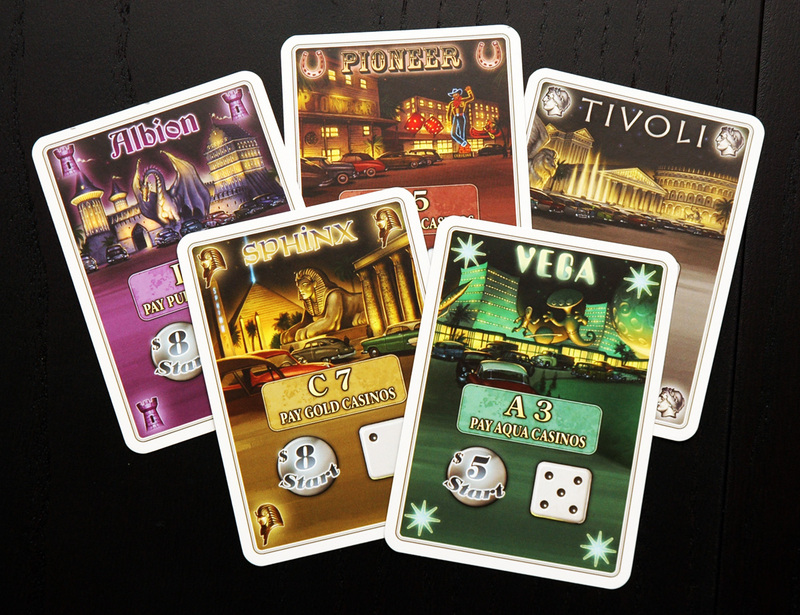 The game centers around a stylized rendition of the classic Vegas Strip where each player gains lots and then develops casinos in those lots, using money gained each round from cards dealt randomly from a deck. There are five different casino groups – each based loosely on iconic casinos from Vegas past and present – that players can build from. Casino blocks built from the same group that are adjacent to each other form larger casinos which can bring in more cash and more points, which are used to win the game. Business as usual on the strip. At the center of each casino block is a die in a certain player’s color. The more pips on the die the better, since the player who has the die with the most pips in a casino block becomes the boss of that casino. Casino bosses can make certain decisions about the expansion and improvement of the establishment. More importantly, each round, whenever a card from the deck is turned over showing that type of casino, the boss of those casinos gains points. They don't call it "craps" for nothing. Points are nice and all (they do win you the game) but no trip to Vegas would be complete without some cold, hard cash. You make money when a casino group is shown on a card dealt from the deck and you have dice in that type of casino, even if you’re not the boss. Money can be spent to buy new casinos, expand existing casinos, force a realignment of a casino (where all dice in that casino are rerolled in the hopes of creating a new boss) or remodelling a casino (changing the casino group it belongs to). You can also gamble some of your money at the craps table each round by betting in an opponent’s casino. If you win, they have to pay out. If you lose, they get your cash – and the house, as always, has the odds in its favor. Still, it’s a great way to make a couple of bucks when you come up short, and nothing feels more like Vegas than losing your shirt – or hitting it big – at the craps table. The early game is a slow burn, but by the sixth or seventh round, things start heating up. Casinos start popping up like weeds, and the scramble for power to be the biggest boss is on. 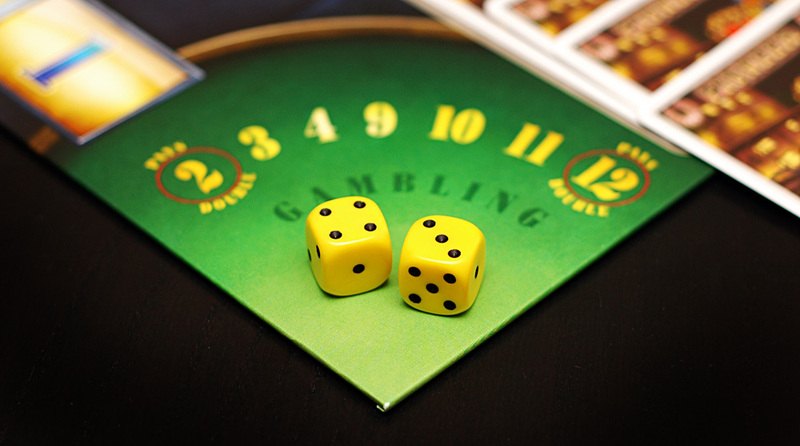 By mid-game, each player is running low on dice and, most likely, tiles of their favorite winning casino, so a tilt in tactics and resources is necessary to stay in the competition. This sudden shift from spending with wild abandon to careful management of built-up leverage makes for an invigorating, exciting and incredibly taut experience – much like a good night in the real Sin City. Although the depth of strategy and breadth of decisions is large in Lords of Vegas, the game is surprisingly easy to pick up. Most players can easily be competitive after a couple of rounds of learning the flow and mechanics. Replay is high, as the shuffled property deck and unpredictability of the dice add fun variables to each game. The slightly gaudy and under-designed box doesn’t do this game justice - the board gorgeously presents the perfect feel of the Vegas strip at night, and the whimsical property card and tile art only add to the ambiance. The card stock is nice and sturdy, and the casino tiles are some of the thickest bits of quality cardboard I’ve seen in a game in this price range. The only drawback in components: paper money. I think everyone knows how I feel about that one; it only took about two turns before we were digging out the good poker chips for some quality cash representation. As for the theme - jackpot; this game perfectly captures the essence of Las Vegas. In Las Vegas, the fun you get out of your trip to the Strip is equal to the effort you put into rolling with the punches and enjoying the ride. The same is true in Lords of Vegas. This game will make you sweat. You will curse. You will cheer. You may end up owing your house to a big guy named Tony. But despite your luck (or lack thereof), in the end - after you’ve straightened your collar and made good on all your marks - Lords of Vegas will make you feel like a real high roller. Overall score: 16 out of 18 - It's Vegas, baby! What more do you need? 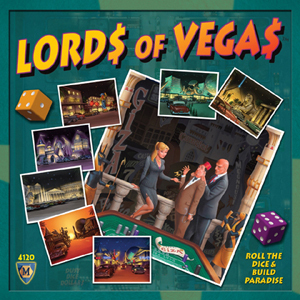 Lords of Vegas is a game for 2 to 4 gamblers, ages 12 and up, from Mayfair Games. It retails for $36 from Funagain Games, or pick it up at your favorite local game store. Man, it’s going to be interesting to see what your game of the year is this year. So many “must play”‘s and it’s only April! But I can fully support that Lords of Vegas is dripping with awesomesauce. Definitely in my top 3 games played over the past year. Good work, as always! Ian – It’s going to be a tough choice for game of the year, that’s for sure! But that’s a problem I’m very glad to have. I can’t wait to see what the rest of the year brings. Thanks! Yeah! We need to confirm with Graham, but I’m totally in. Be there or be square. 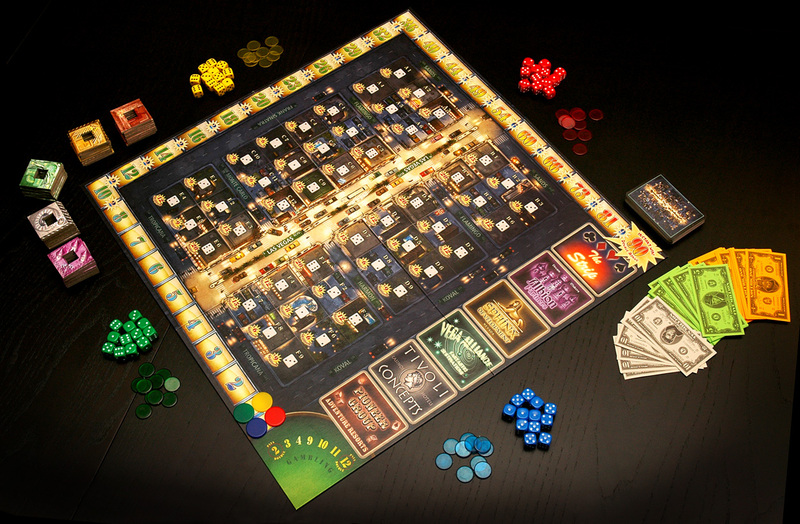 Lords of Vegas is two-dimensional Monopoly. I mean that in every sense of the term. At its core, the game plays a lot like Monopoly. Each turn you have the opportunity to buy a property determined at random. These properties get better when they are next to each other and they pay out on a random basis as well. Where the Monopoly board is literally one dimensional (there is a single track with a single direction), Lords of Vegas is two dimensional, with a grid of properties that can be relevant to each other in up to four directions. Lords of Vegas also adds another dimension of gameplay to Monopoly. 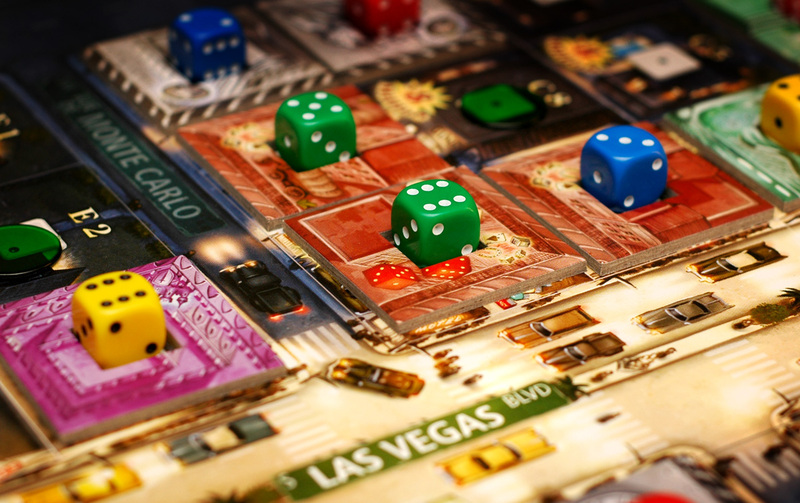 There are few real decisions to make in a game of Monopoly, particularly when players aren’t terribly inclined to trade properties, but Lords of Vegas offers many more choices to the player and those choices tend to have more impact on the game itself. This game edges out Fast Food Franchise for the best variant of Monopoly ever. Whether that’s good enough for you or not is a matter of taste. The board uses graphics taken from the video game Grand Theft Auto 2!